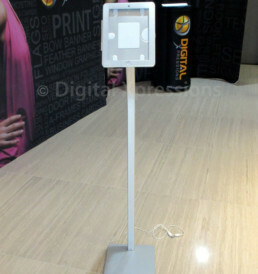 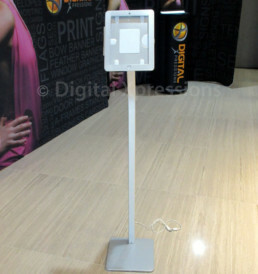 This silver color iPad stand is designed specifically for trade show use and can use it in any events. It is a support bracket for iPad and let iPad charging or data transmission via attached USB cable, enabling you to occurrence reading, movies, videos, tweets and apps all hands-free in nearly every situation. The iPad stand has a built-in cable with a charging cable that runs the length of the interior of the pole to hide any cords. 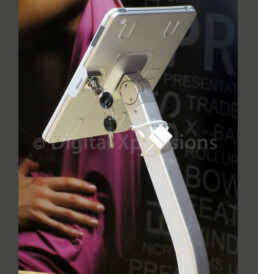 Adjustable viewing angles with 360 degree rotatable. Made with high quality Iron and Aluminum Alloy. 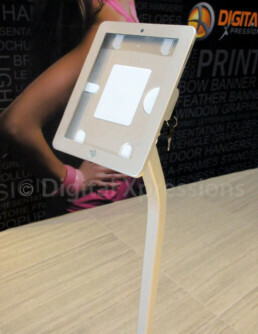 Comes with lock to secure iPad.